What happens if the NC Legislature repeals the rules for reducing pollution to Jordan Lake, a drinking water source for nearly 300,000 triangle residents? If you’re the sponsor of the bill, Senators Rick Gunn (R-Burlington) and Trudy Wade (R-Greensboro), you hope that development is spurred and that municipalities save on the cost of implementing pollution control measures. Excess levels of pollution will still flow to Jordan Lake but we can figure out a way to deal with that later. Let’s call this a “no plan” scenario and discuss possible outcome for when the State fails to plan. Extensive monitoring of the Lake during the 1990’s and 2000’s established that Jordan Lake is impaired for nutrient related water quality violations (i.e., too much nitrogen and phosphorus). Further assessment by the State identified sources of pollution and established a plan to reduce pollutants from those sources to eliminate impaired conditions. This plan, known as the Jordan Lake Total Maximum Daily Load (TMDL), was submitted to, and approved by, the EPA which required such a plan because of the Lake’s impaired status. If the State repeals that plan without a suitable alternative, the EPA can step in and enforce their own plan. This scenario would not be a good one for communities in Jordan Lake and here’s why. Unless there’s better science telling them differently, EPA would likely require the same amount of nutrient reductions required under the State’s current plan. The difference between the State’s plan and an EPA driven one would be that the EPA could only enforce their plan on permitted sources such as municipal wastewater treatment plants. The State’s current plan is more balanced and looks to get reductions from all sources of nutrients. An EPA driven plan, therefore, would require the same amount of reductions but from fewer sources. 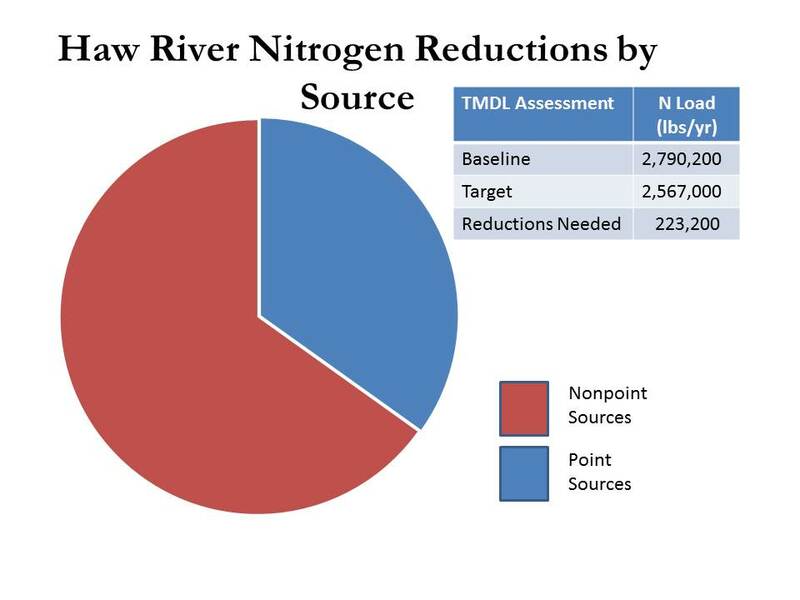 Shown in the pie graph for the Haw arm of the Jordan Watershed, total nitrogen reductions needed for the Haw add up to 223,200 lbs per year. Currently, these reductions are addressed by the State’s plan that seeks reductions from both permitted point and non-permitted nonpoint sources. Under an EPA plan it’s likely that the nonpoint portion of reductions currently covered by the State’s plan would be shifted to the point sources. The result would be more reductions from permitted sources in the form of costly upgrades to wastewater treatment plants in Jordan’s watershed. One final option EPA could exercise is even uglier. It’s their ability to prevent new or expanded discharges in Jordan’s Watershed. This option would potentially cease development activity. The above EPA options are not ones that Senators Gunn and Wade are seeking yet they are very possible. The State’s current plan is a more balanced approach and should be given a chance to work. Senate Bill 515 should not be allowed to prevent this from happening.